Driving home one night after playing a show with his band, Phred Williams felt a pain in his arm and tightness in his chest. It wasn’t until a few moments later he realized he was having a heart attack. He drove himself to a local hospital near his home where he was told he needed to immediately receive a stent. After he was prepped for surgery, Phred was left alone and did not receive medical treatment for 11 hours. It was during that time Phred’s heart became unresponsive. 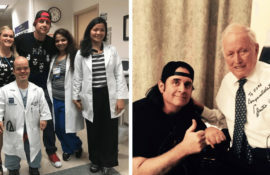 After being discharged from the hospital, Phred was referred to Dr. O.H. “Bud” Frazier and the team of experienced cardiologists at Baylor St. Luke’s Medical Center. His cardiologists quickly determined Phred’s heart needed immediate attention. He had one of two options—a left ventricular assist device (LVAD) implant or a heart transplant. Phred, who has played drums for the majority of his life, considered getting an LVAD. 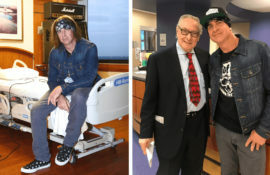 However, after learning he would not be able to play the drums on the level that he was accustomed to if he received the LVAD, he decided to move forward with a heart transplant. Phred was put on an intra-aortic balloon pump (IABP), a machine that helps the heart pump blood, while he waited for a donor heart. After more than seven months of waiting, Phred successfully underwent heart transplant surgery at Baylor St. Luke’s.